The last few days of school are CRAZY! We turn in all our student technology (aka NO Chromebooks) and textbooks. So, I like to make each of those days all about having fun and just enjoying each other’s company for the last time. I also tell my kids that we work hard all year to earn special days like this. Our end of the year activities included a variety of fun themed days such as camping day, beach day, field day, scavenger hunt day, and many more. 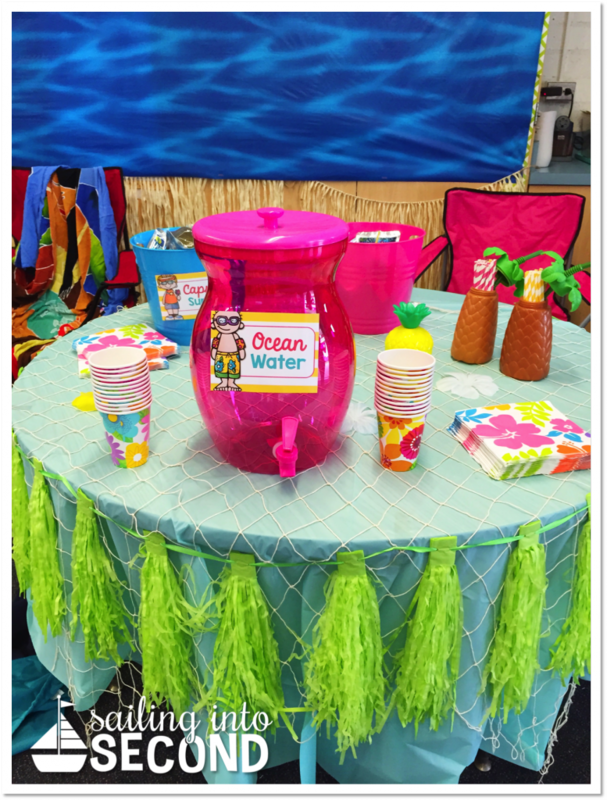 Today I’ll be sharing how you can turn your classroom into a learning beach paradise! After posting some pictures from my beach day, I had a few questions on my FB and Instagram on how often I do these special themed days. Honestly, it takes A LOT of planning and work, so I only transform my room at the end of the year. It isn’t something I do every day or even every month. I would have loved to keep my room like this for the last few days of school, but with our schedule and school events, it wasn’t really possible. Another question was where I got all my decor and tableware. 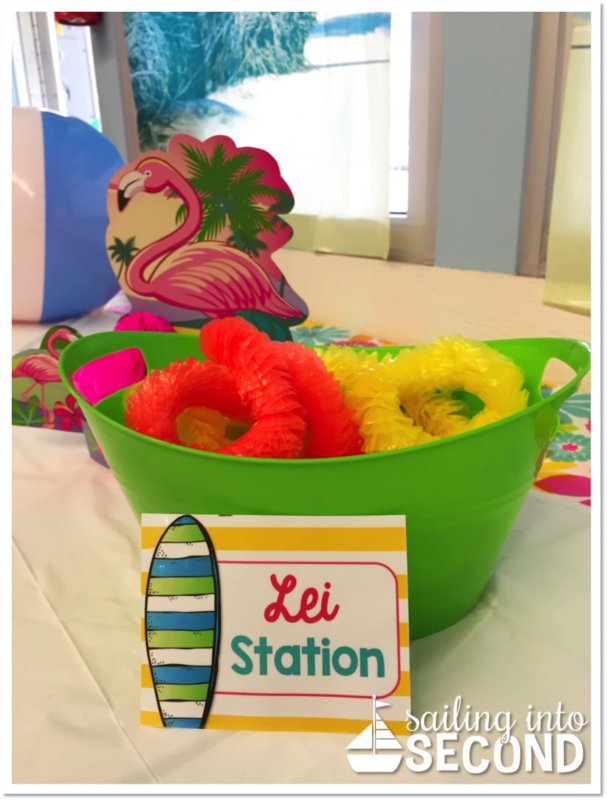 Dollar Tree had TONS of beachy/luau decor for super cheap! I picked up the hula skirts, leis, tableware, cups, napkins, decor (little pineapples, fish nets, and sand pails), and colorful buckets/tubs to place all the snacks/drinks. I also hit up Party City and grabbed a few things there too. It cost about 50 bucks for all the decor and snacks I had that day. The great thing is that once you’ve purchased all your items, you can store the decor and most materials in a plastic tub to reuse next year. 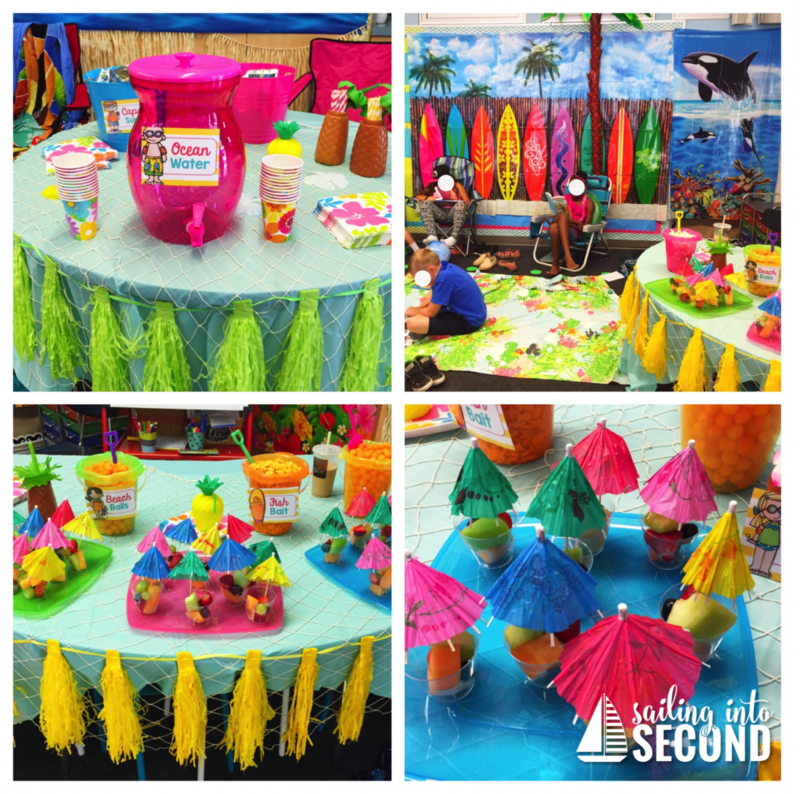 Here are a few snapshots of what my classroom looked like for our Beach Day! My kids were SO excited and engaged the WHOLE day! They couldn’t wait to come into the classroom that morning to see what our room had transformed into. This was the snack table. 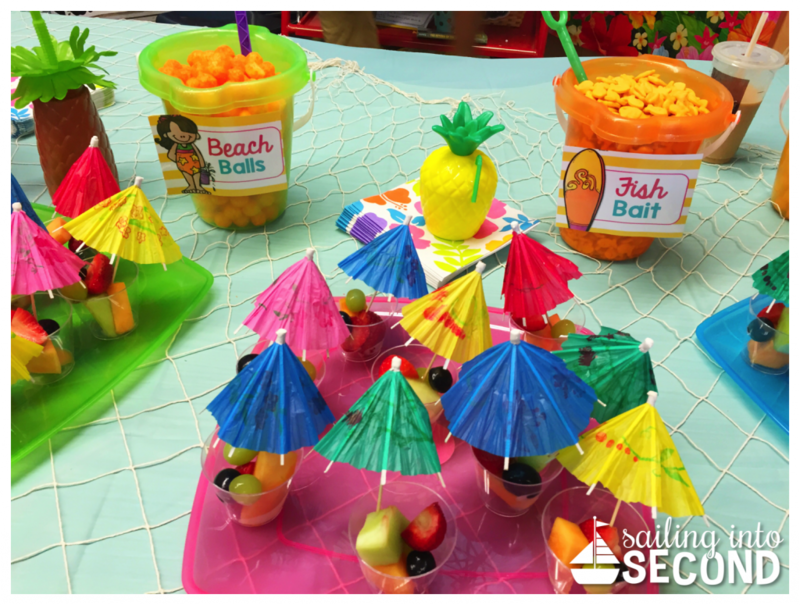 I used the sand pails from Dollar Tree and filled them up with fun snacks. I called this area the hydration station! 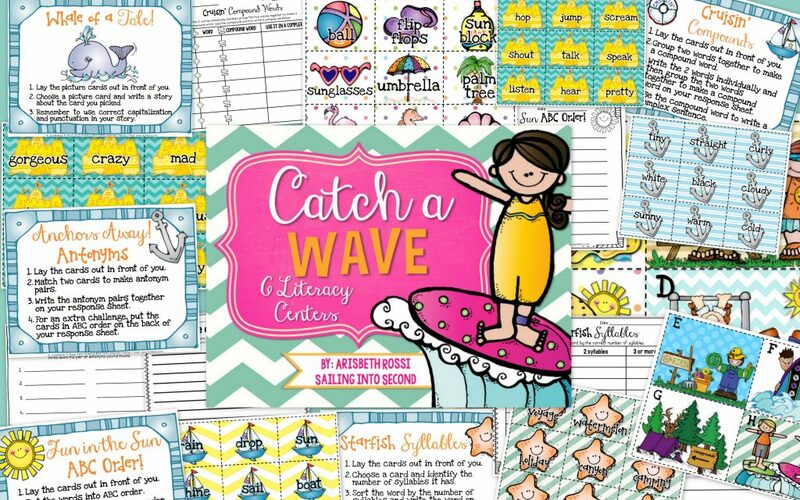 Would you like to use these beach day labels in your classroom transformation? 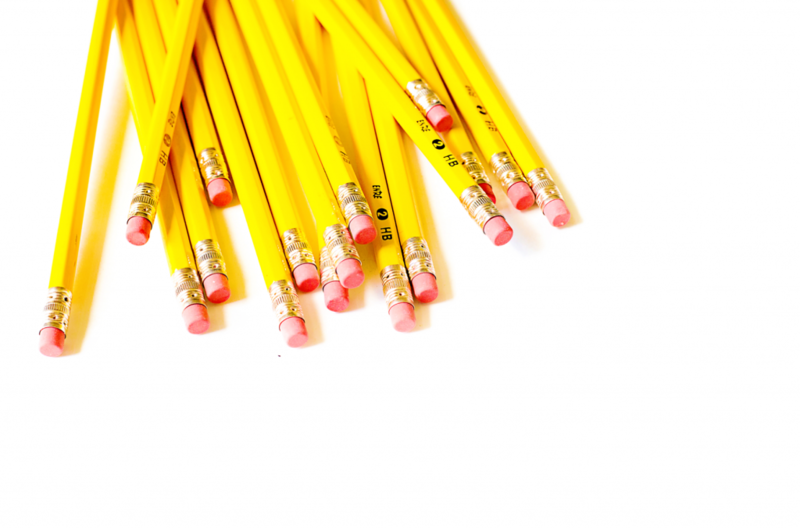 Just drop your name and personal email address in the contact box at the end of this post and I’ll send them over to you right away into your inbox! They got a kick out of the “ocean water” I had for them. It was just water with a drop of blue food coloring! 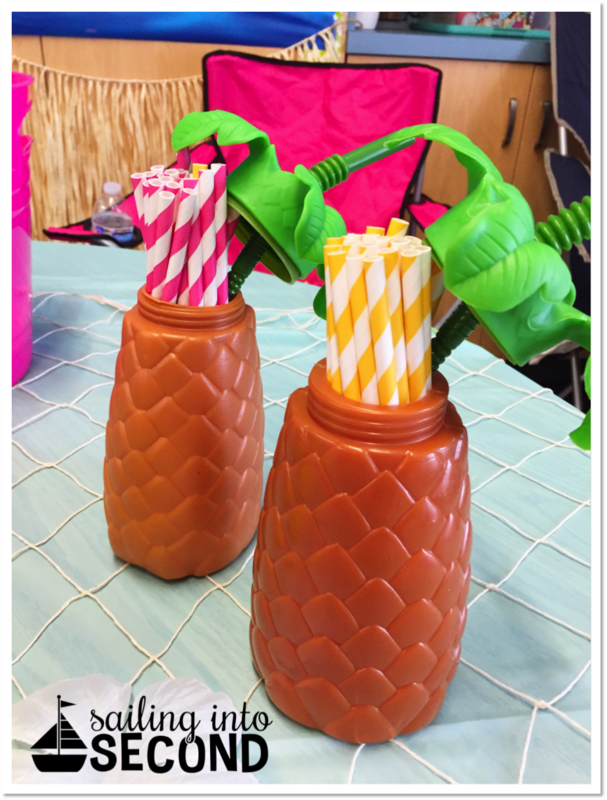 These pineapple containers from Dollar Tree were the perfect container to hold our straws. I used some little cocktail umbrellas for the mini fruit cups. They were too cute! Each student grabbed a lei at the beginning of our day to get into beach mode! 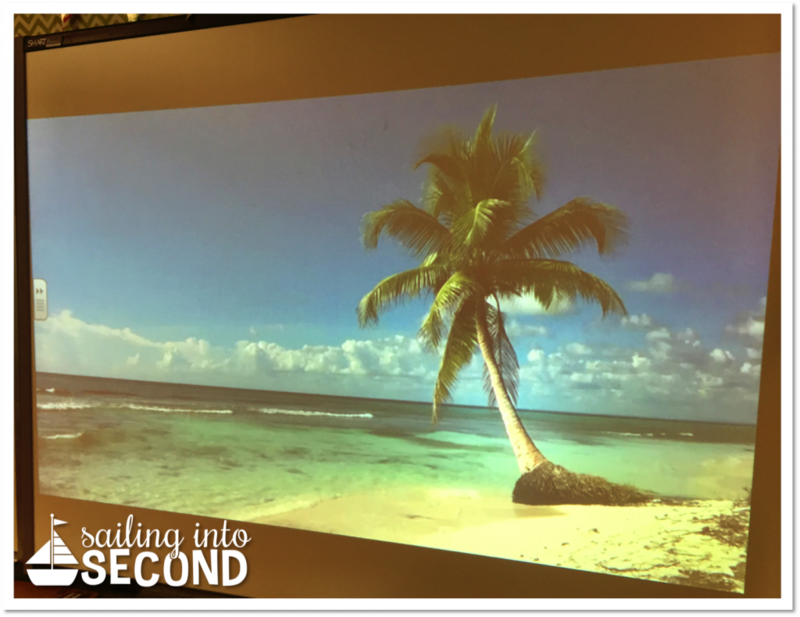 This fun beach video was playing for most of the day. The kids LOVED it! I think it really transport us to a learning paradise. You can click on the image to take you directly to the Youtube video I used. Overall, I was SO happy my students had a blast indoors! They were engaged while we were reading, taking GoNoodle brain breaks, and learning. Our principal came by and hung out with us for a bit too. I think she secretly wanted to be a third grader that day! 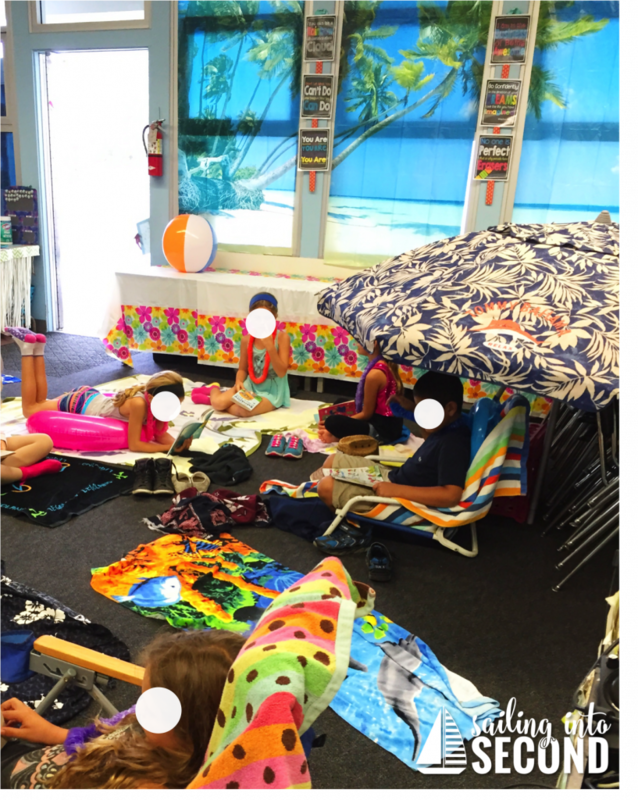 :) I also used some of my beach themed ELA Centers during the language arts portion of our day. You can grab a copy of those by clicking the image below. 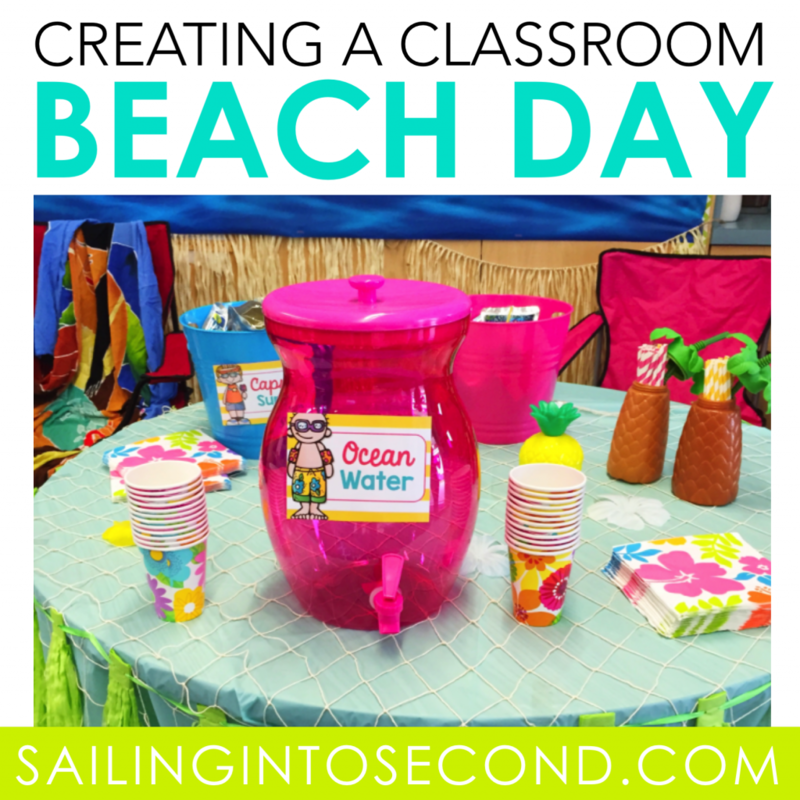 Have you done an indoor beach day with your students? I’d love to hear more tips and tricks from you!! They will remember this forever! How fun!! You’ve got a knack for carrying out a theme :) Loved all the food names! This looks like a lot of fun! Your decorations were super cute too! I’m in love with the window covers! It makes it look like the ocean is just outside. Where did you find them? What are they made of? Where can I find these labels? 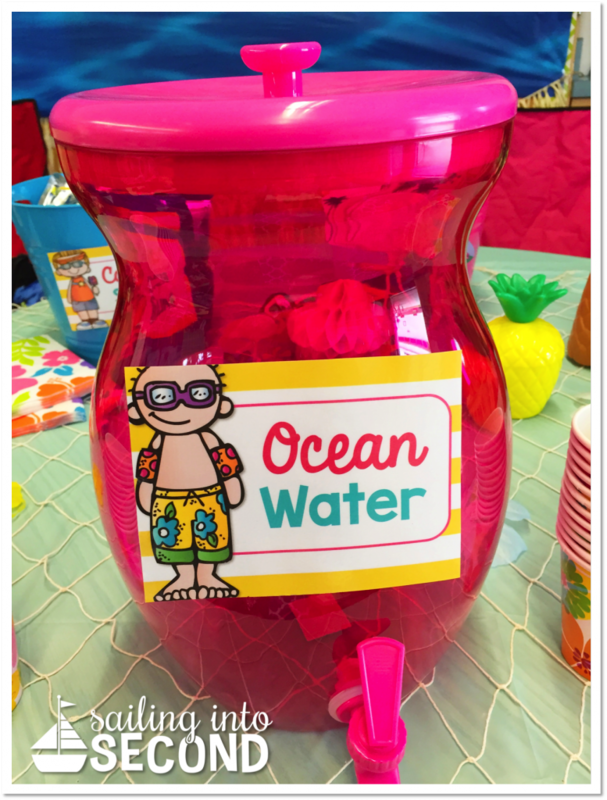 I’m planning an end of the year beach party as well. Would love to use the same or similar labels!! What are the otter pops?